Little Louie is stuck in bed with a bad cold. His nose is clogged, his ears are crackling, and his brain feels full. All he wants is his mom to take care of him, but whenever he calls out for her, his stuffed-up nose summons slobbery dog Bob instead! If you or a family member has ever had a bad cold in which you nose was stuffy, your head hurt, and your ears crackled, then this book will be one you can relate to easily. The authors tell the reader to read the book as if you had the worst cold ever. So you know when you are sick with a cold sometimes your words do not sound quite right. 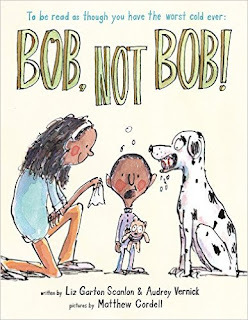 In this delightful story the little boy with the cold only wants his mom, but he says Bob instead due to his cold. The story brings about some funny events which will have you and your child laughing. The illustrations by Matthew Cordell capture the text perfectly. The expressions on the mom and the miserable little boy are filled with humor and realism too.